Cmetrick Too is a puzzle made by elogIQ, who also make the Cmetrick. It consists of a frame containing a 2×2 array of overlapping spheres. Each sphere has a central core with 6 coloured discs on the surface, arranged symmetrically like the faces of a cube (i.e. on opposite sides along three perpendicular axes). Where two spheres overlap, they share one of those discs. The discs that are not in one of the overlapping areas are visible through holes in the frame. In the solved position the spheres each have a single visible colour (red, blue, green, yellow) and the hidden shared pieces are white. The spheres can rotate around the two axes lying in the plane of the puzzle. There is a more difficult version called Cmetrick Too Hard. 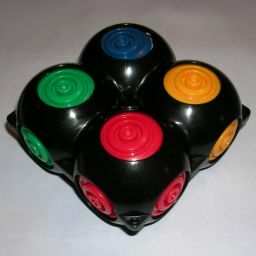 It is very similar to the normal Cmetrick Too, except that the coloured discs have a centre spot of a different colour. In the solved position, each face has only one colour in its centres. This means that the coloured discs on a ball have to be correctly ordered too. Note that the centre colour is only visible on one side of a disc. This puzzle can be seen as the three-dimensional equivalent of the Circle Puzzle, and it is not much more difficult except for the fact that some pieces are not visible. CMetrick Too was invented and patented by Dror Rom, 10 August 2004, US 6,773,011. From June to August 2006 I hosted a contest for the CMetrick Too Hard on behalf of elogIQ. For the results and more information, visit the Cmetrick Too Contest results page. There are 20 pieces, 5 colours, four of each colour. This gives 20!/4!5 = 305,540,235,000 possible positions, and all of these are attainable. Counted this way the puzzle has 4!=24 solutions because the order of the coloured spheres is not important. You could also consider the four non-white colours interchangeable, and count positions that differ by colour swaps to be identical. The total number of positions is then divided by 4! to get 12,730,843,125 positions with only one solution. On the Cmetrick Too Hard on the other hand only the white pieces are identical. This gives 20!/4! distinct positions. There are however four distinct solutions. You can swap the top and bottom pieces of all the spheres and/or you can swap the pieces diagonally as if the whole puzzle has turned 180 degrees about its vertical axis. From June to August 2006 I hosted a contest for the CMetrick Too Hard on behalf of elogIQ. See the Cmetrick Contest write-up to see the techniques used by the winners to find optimal solutions. elogIQ manufactures Cmetrick and Cmetrick Too and sell them on their site. Choose a sphere to solve, and the colour you want it to become. Note that on the Cmetrick Too Hard two of the colours will not show its centres on this sphere, and the other two colours will. Rotate the chosen sphere so that one of its incorrectly coloured sides lies on a shared side, shared with one of the adjacent unsolved spheres. Find a disc of the chosen colour that does not lie on the sphere. Remember that it may be hidden from view. Move the chosen disc to the previously mentioned shared side of the sphere, replacing the incorrect disc that was there. 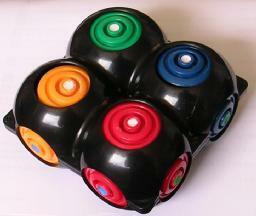 Repeat steps b-d until all four coloured discs lie on the chosen sphere. Make sure however that the last two unsolved sides do not lie opposite each other. Rotate the sphere so that both its unsolved sides are hidden. Phase 2: Solve the second and third spheres. Choose one of the two unsolved spheres adjacent to the first one, and choose the colour you want it to become. Use the same technique as explained in phase 1 to bring one of the white discs onto the chosen sphere, if the sphere doesn't contain a white disc already. Use the same technique as explained in phase 1 to bring the four discs of the chosen colour onto the sphere, making sure that one of them lies opposite the white disc. Rotate the sphere so that the white disc is shared with the previously solved sphere, and the unsolved face lies on the other shared side. Repeat steps a-d for the next unsolved sphere. Phase 3: Solve the last sphere. If the two white discs on the last sphere are on adjacent sides, rotate the sphere so that they are both hidden and the puzzle will be solved. If the two white discs are on opposite sides, then do the following steps. For conciseness, I'll call the last sphere L, and any adjacent sphere A. Their colours are also denoted by L and A. 1. Turn L so that one of its opposing white discs is shared with A. 2. Turn A a quarter turn to replace the white disc by a disc of colour A. 3. Turn L a quarter turn in any direction. 4. Turn A back to bring the white disc to the side shared by L and A. The two white pieces on L are now adjacent. 5. Turn L back to bring the piece of colour A back to the shared area. 6. Turn A again to bring the piece of colour L back to the shared area. Note that sphere A looks completely solved now. 7. Turn L so that its two white pieces are on the shared sides. Phase 4: Solve centres (Cmetrick Too Hard only). Note that when solving the first three spheres it is fairly straightforward to also make sure their centres are correct. Then you only have to apply this phase to the last sphere, and not to all of them. Examine the centres and work out which face should be which colour. If turning a sphere upside down will put more centres in place than there were before, then do so. 1. Turn L so that disc 1 is in the shared area between spheres L and A. 2. Turn A so that its white disc is now in the shared area, replacing disc 1. 3. Turn L so that disc 2 is now in the shared area, replacing the white disc. 4. Turn A so that disc 1 is now in the shared area, replacing disc 2. 5. Turn L back so that that previous white disc now replaces disc 1. 6. Turn A so that disc 2 is now in the shared area, replacing the white disc. 7. Turn L to its solved position, both its white pieces being hidden. 8. Turn A to its original position. Using the swap above you can reorder the coloured discs of any sphere so that its centres are correct.